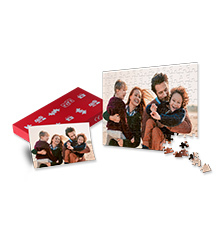 Create your own 112 piece puzzle and decorate it with your own personal photo. Spend time with family or friends assembling a puzzle while remembering the joyful times that you spent together. Original photo included separately, a generic photo will be printed on the packaging. This item is usual ready for dispatch within 5 working days, plus postal delivery time. You will find detailed information on Pixum delivery here.